We were just on Maui and purchased more of your products for my 2 sons. We got them from the store at the Mill House. We also added to what we have. Your craftsmanship brings us great joy. Mahalo! While visiting Maui, I bought a beautiful Maui Potpourri apron in the Olelo aqua fabric. After I got home I checked out Jamie’s website and was able to order a table runner from her in the same fabric! Received it within a few days – Love It! – beautifully made – and she provides great service! Thank you Jamie! I love the beautiful placemats and napkins that I purchased from Maui Potpourri. The vintage fabric is gorgeous. They offer a wide selection of fabrics which made my choice especially difficult. But I could not be happier. I had a perfect experience with my order and they were even kind enough to give me a refund for over-payment of shipping! Here’s the story of the above picture I was planning a 13th anniversary dinner party to surprise my wife. 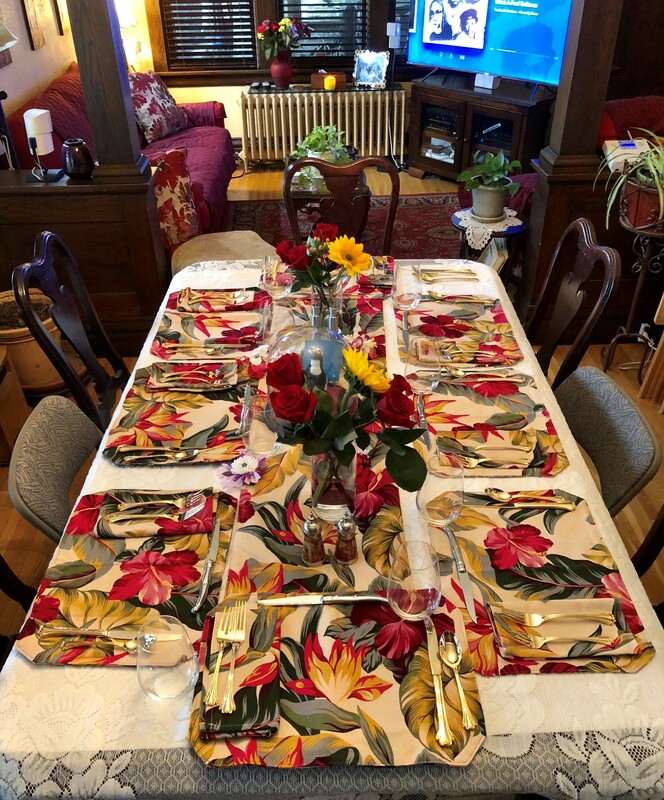 In April she had purchased some wonderful Maui Potpourri napkins, placemats and table runner. I thought I was all set. The dinner for 8 was on a Sunday. The Wednesday before I realized that we only had setting for 4. Panic ensued. I reached out via email and phone and asked if they had the pattern. The answer was “sort of”. In order to get it on time they would have to get what they had together and then to the US Post Office by 10:00 AM Thursday for Express Mail. I sent payment right away via PayPal. At a little after 10:00AM Hawaii time I got a notification the the package had started its journey to Honolulu and then the mainland. The additional napkins and placemats arrived and a beautiful table was set. Mahalo to Jamie for going the extra mile for a customer she did not know thousands of miles away in Minnesota. This is the kind of customer you can’t get from Amazon. Many thanks for being a part of our celebration.